I’m increasingly on the road in my role at Ketchum. My iPad has become an invaluable piece of kit for working on the move. The functionality and productivity benefit of apps is so good that it’s almost become possible to run a communication team or public relations agency from a tablet device. Presentations – export slides as JPEG images from your presentation software and load them into the photo library. Presenting from an iPad is very natural and allows you to hand the iPad around your audience. Importing images into an iPad can be tedious. I’ve found the easier way is via a memory stick using an iPad memory card reader. Writing – an iPad starts up immediately and is great for note taking. There are lots of free word processing apps but I’ve paid $10 for iWork Pages. It’s worth every penny for a fully functional word processor with features such as formatting, spell checker and word count. File formats integrate with word. Publishing – there are any number of ways to publish content to the web using an iPad. Managing formatting can be tricky using the touch screen but there are apps for all the key blogging platforms and content management systems. My favorites are Tumblr and WordPress. Photos – photo manipulation pushes the iPad to its limit because the touch screen limits how accurately you can edit images. Applications counter this with preset features to crop, rotate, adjust, enhance and touch-up images. My favorite is Photogene for its ease of navigation and preset features. Storage – there are lots of virtual disk drive services available to the iPad user accessible via the internet using apps. I use DropBox for general storage and Google Drive for documents when I’m collaborating with other people. Social – each of the main social networks has its own iPad app to varying levels of sophistication. 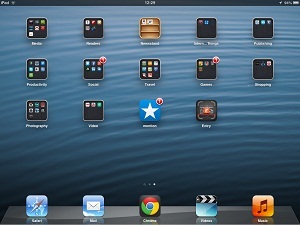 I’ve loaded my iPad with Facebook, Google+, LinkedIn, and Twitter. Google+ is the best user experience. Communication – mobile phone roaming charges can be expensive when you’re traveling unless you have a phone on an international tariff or buy an international SIM card. The frugal solution lies in using Facetime with fellow iOS users or Skype. Google Hangouts are also very effective. Media – subscribe to the iPad edition of your favorite newspaper or magazine. The New York Times and The Week are my priorities. I also like the BBC iPlayer app for catch-up and movie rentals via iTunes. Monitoring – Sprout Social is my application of choice for monitoring and engaging with multiple social media streams. I generally use as my preferred Twitter client as it has good analytics and reporting. Mention is proving to be a strong contender for basic reputation monitoring. Travel – The printed itinerary and travel guide are a thing of yesteryear. TripAdvisor provides suggestions of where to go, Google Maps help you get there and I’m amassing a small library of online travel guides. This post first appeared on the Ketchum blog - 10 Ways to Use an iPad for Public Relations.